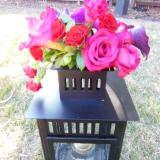 Experienced floral design school serving San Francisco Bay Area and San Jose. 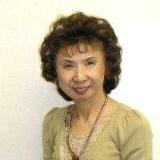 California Flower Art Academy specializes in training people who would like to earn practical skills of European floral arranging, Japanese Ikebana & wedding floral decorations. California Flower Art Academy is pleased to offer a WIDE RANGE OF PROGRAMS from which students can make a best choice of their most favorite course by well considering their own private schedule, purpose, goal and budget for learning flower arrangements. 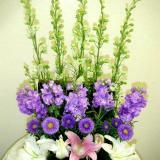 European floral arrangement is designed with elegant, graceful and detail oriented concept. Compared with American style, the size of most European designs is compact. 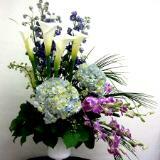 Due to these reasons, European flower arrangements are widely accepted in Japanese floral design industry. 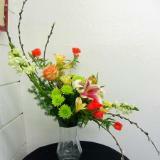 Ikebana is a Japanese traditional floral art that has a long history. 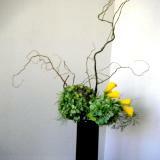 Due to Japanese unique culture, Ikebana has unique and creative arrangements that are totally different from European or American style of floral designs. If you love flowers and have interest in Japanese traditional cultures, it is recommended to learn Ikebana arrangement that has a long history. 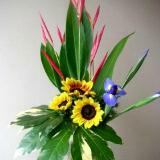 Recently many people outside of Japan are interested in learning Ikebana. For those who are already enjoying American or European floral designs, learning Ikebana MAY help develop a more creative style of floral arrangements. Since there are uncountable types of wedding flower arrangements, we are pleased to introduce a broad range of decorations. In order to earn skills of wedding floral arrangements, it is mandatory for you to have already learned basic floral designs without which it is difficult to learn wedding decorations. Pomander is also another important decoration item which enhances the beauty of brides at weddings. Pomander is also called kissing ball. The typical use of pomander is for a bride to hold at a wedding. 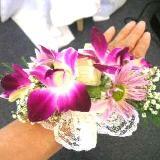 Bouquet is one of mandatory items for enhancing the beauty of brides at weddings. 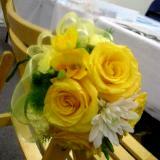 There are so many kinds of bouquets in terms of shape, color and the way of making. 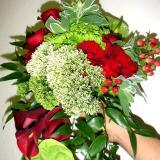 We are going to introduce as many bouquets as possible in this gallery. 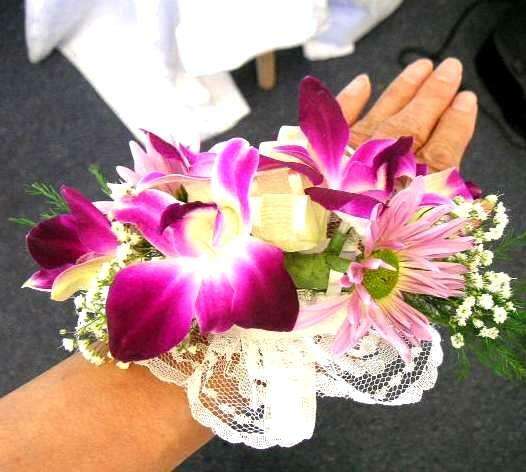 It usually takes about two hours to make a once piece of regular bouquet. 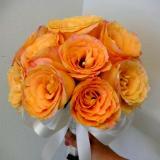 Among various kinds of wedding flower arrangements, bridal bouquet is one of the most important designs. 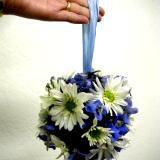 We are totally unable to imagine a bride who has no bouquet. 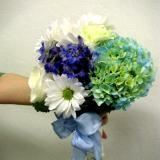 By holding a bouquet, a bride looks more beautiful and attractive. When most of people learn floral arrangement, it is quite common to start from table arrangement that is also known as a centerpiece decoration. 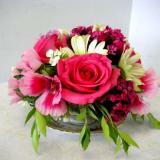 You can find flower basket or basket floral arrangement at various occasions and places. 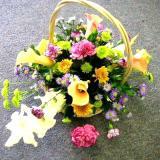 Basket arrangements can be used at a variety of events such as wedding party, birthday party as well as a gift item. 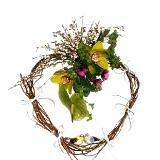 If you want to offer a gift to your loved one on his birthday etc., why not make basket flower arrangement ? 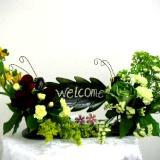 The recipient of this home made gift must be quite impressed with your custom designed gift. You can place a small additional gift (your loved one likes) in the basket. Many of table arrangements are designed with a vertical shape and many people start learning floral designs from vertical arrangements. Since vertical arrangements do not require large space, it can be displayed at various locations UNLESS the arrangement is extremely high. 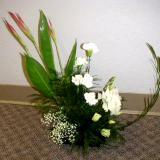 Horizontal arrangements usually need spacious place for displaying it. 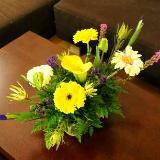 We can often find a horizontal flower arrangement placed on the desk when newscaster talks on TV program. Or another popular use is a decoration of wedding head table where bride and groom take seats together with their parents. One of the important features of all round arrangement is that this design looks round no matter from which angle we view it. This is totally different from vertical arrangement and horizontal arrangement. 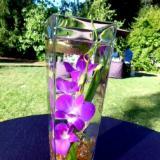 Lots of people pay special attention to wedding floral decorations. When it comes to funeral floral designs, they do not pay any special attention or they do not show keen interest seemingly because wedding is a very happy event but funeral is a sad and miserable event. People are apt to stay away from sad events, which is quite understandable. 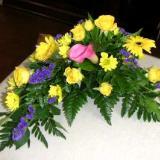 From a view point of pure business, funeral flower decorating service has a lot of demand throughout the year. 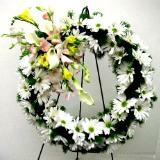 Wreaths are found in various locations. 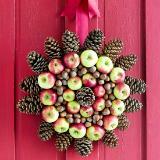 Sometimes it is mounted on the front door or walls inside a home. 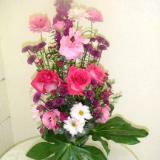 In case of event decoration they are often mounted on easel and displayed at or near the reception desk. Vertical flower elements are placed in parallel each other. This way of design is called parallel arrangement. Due to its shape and volume of flowers, this way of decoration always looks gorgeous. For expressing and showing love to beloved ones, it is a great idea to design, make, send or display heart shaped floral arrangements. You can send heart shape arrangement to your friend as a gift on his/her birthday or Valentine's Day to express your love. 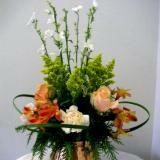 The main player in floral arrangement is of course flowers and flower petals. However we sometimes find designs that feature other things than flowers. Namely rather than featuring flowers, green leaves and branches/twigs are focused. 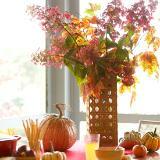 It is not always necessary to use a regular vase or container when making flower arrangements. If you don't find any good container around you, you can use whatever kind of kitchen item you like such as dinner plate, mug cup, coffee cup and cup and saucer etc etc. In this page I will introduce some of simple arrangements made using a mug cup and cup n saucer. Since these arrangements are quite small in their size, you don't need a spacious place to display it. Floral arrangements with candle decoration are quite popular not only in our daily home decoration but also in a special event such as Christmas party etc. 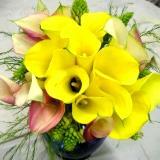 If you make your own floral decorations in your daily life, you must be quite interested in candle flower arrangements. 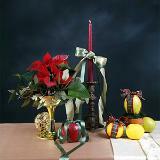 The photos in this page show some examples of candle floral arrangements. 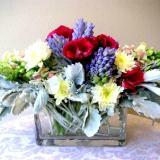 If you would like to send a gift to your friend or family member, flower decorated gift box is quite useful. 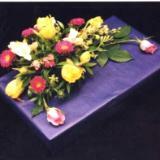 You can decorate a gift box with beautiful flowers and put a gift in the box. This is a unique hand made gift with which a recipient of your gift will be very impressed. There is only one gift that is designed by you and hand made by yourself. Centerpiece is also known as table arrangement that has a broad range of designs from easy ones to highly value-added difficult ones. When teaching to students, floral design instructors often choose an entry level of centerpiece decorations for beginner students. 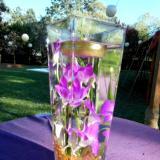 In the slide show of this section, you can find a variety of centerpieces. In order to make the best use of limited space of cocktail table, you can make a flower arrangement matching the corner shape of a table. 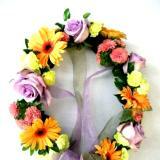 As its name shows, crescent arrangement is made in a crescent shape. 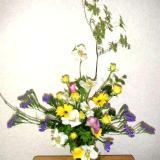 This way of arrangement is quite popular in the field of Japanese Ikebana art. The typical pumpkin arrangement can be found at the time of Halloween in America. There are so many kinds of pumpkin arrangements and many of them have nothing to do with Halloween. If you are planning to enjoy Halloween by making pumpkin decoration, the photos in this section MAY be useful. 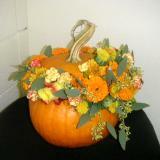 California Flower Art Academy teaches how to make pumpkin decoration when getting closer to Halloween. 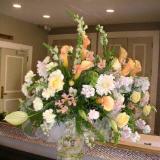 For decorating a foyer, elevator hall or hotel entrance hall, we often find beautiful flower arrangements. Depending on the availability of space, we should adjust the size of floral decorations from medium to large size. 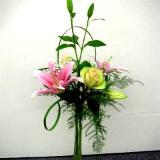 There is a beautiful floral design that could be called linear curve arrangement. This type of arrangement features graceful beauty of linear curve created from curly element such as curly willows and branches. 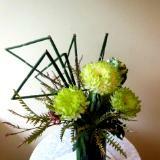 Ikebana arrangement uses these materials because Ikebana often focuses on linear curve beauty in floral designs. 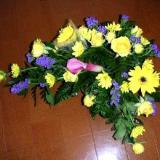 Some European or American flower arrangements are affected by above mentioned Japanese way of arranging. 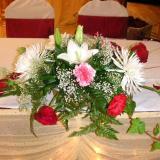 We are quite sure that you have heard of table arrangements if you are familiar with floral designs. Then how about chair arrangement ? Have you ever heard of "chair arrangement" ? The answer from most of people is "No". Only because the use of chair arrangement is quite limited, it is not popular at all. 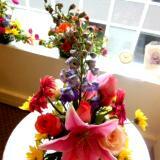 However there does exist flower arrangement made with a chair. 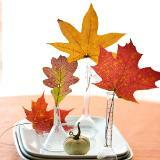 All the arrangements and centerpieces introduced are fall decoration using autumn leaves and pumpkins. The photo source for all designs is Better Homes and Gardens. As its name shows, S shape arrangement is the arrangement in the shape of alphabetical letter S. This arrangement always features the beauty of curved line. 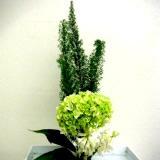 Japanese traditional Ikebana often offers this way of arrangement. 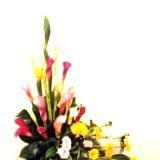 You may have found a tall and long glass container in which flower arrangement is made. Such floral decoration is often displayed at the time of open house of new restaurants, office building and wedding reception. It is also found at a reception desk of event and business office. 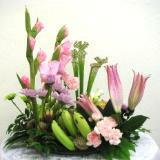 Due to its shape and style of arrangements, line flowers are used for this design. 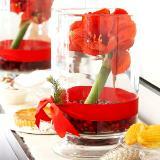 One of the simple and easy floral arrangements is a design using a small size of cubic glass container. 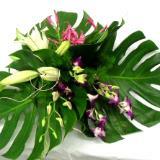 The size of this flower decoration is quite tiny and it does not need any spacious place for display. You can save your valuable time and money for making this kind of arrangement. Here in California where our floral design school is located, tropical flowers are so expensive seemingly because many of them come from Hawaii. 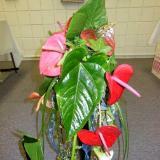 Due to expensive transportation cost between Hawaii and California, the price of tropical flowers become so expensive. 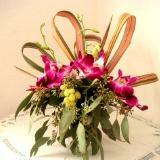 From time to time we teach how to make floral arrangement using tropical flowers. 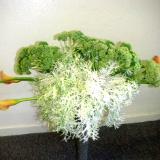 California Flower Art Academy teaches a variety of floral arrangements from easy one to difficult ones, regular design to unique ones, ordinary arrangements to creative ones AND beginner to professional levels. 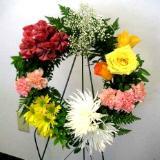 There are several ways to prolong the life of fresh flowers. Especially during a hot summer season, you must have experienced how difficult it is to keep flowers as fresh as possible. I would like to mention the most primitive and affordable way as follows: 1. All pomanders and flower balls shown in this page are made by students, instructor and graduates of California Flower Art Academy . Have you ever heard of POMANDER ? How about FLOWER BALLS ? Don't you know KISSING BALLS ? Many people have never heard of it and they have no idea at all about these terminologies. 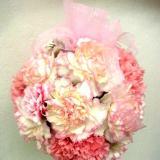 They are balls made of flowers and often used at weddings. California Flower Art Academy has been doing its best efforts for minimizing the increase of lesson fees since its foundation back in 1990. We have been trying to keep the original prices of lesson fees somehow or other. However for the past 24 years, the prices and cost of everything have been raised such as gasoline, classroom rent, flower materials fee as well as electricity and gas charge whatsoever.